One of the best ways to make saving money easier is by making it fun. With the internet, it has become easier to share these new fun ways to save through challenges and printables. Check out the 26-week savings plan below! I’m always looking for ways to save that make sense for our family and our needs. I’ve looked into shorter challenges that will allow us to focus on saving for the first three months of the year while we snowball our debt for the remaining nine months (which will help with savings too). 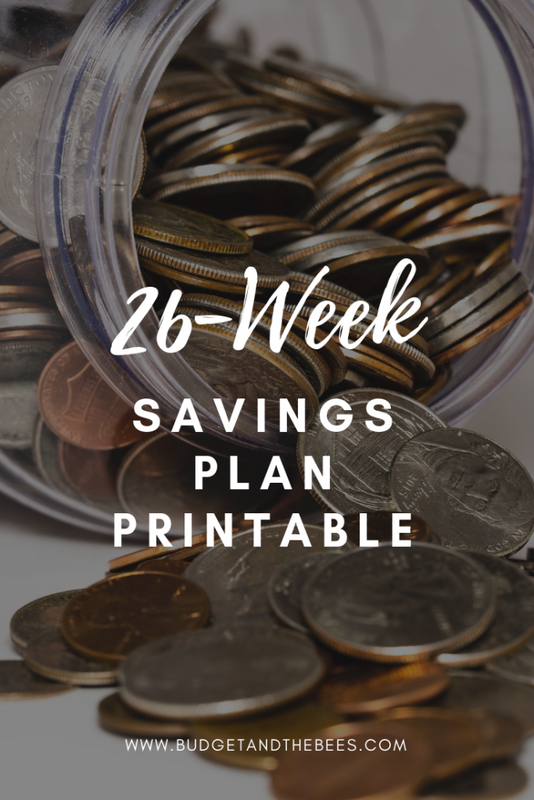 However, I decided to look at what a bi-weekly 26-week savings plan would look like for us and how it can be altered for other individuals. 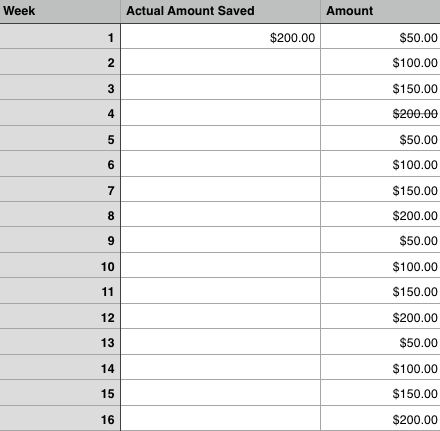 For our savings plan, I’ve broken bi-weekly savings goals into $50, $100, $150, and $200 amounts. Depending on what time of the month you get paid, you can alter that week’s savings goal to bend to your bills. For instance, if the first check of the month is where most of your bills land, plan on that being a $50 or $100 savings week. The lighter half of the month can be when you share either $150 or $200. As you can see above, in the first week we plan to save $200. Then, you cross that off of the savings amount column. After you complete your first week, alter your weekly savings goals (between $50 and $200) according to your personal needs. At the end of the year (or end of the 26-week plan), you’ll have saved $3,150. Download a FREE spreadsheet for tracking your 26-week savings plan. The 26-week savings plan laid out above is a spin on multiple savings challenges you may have seen on the web. Challenges got started with the 52-week money challenge. During this challenge, you save more and more money each week (starting at $1) before you reach the end savings goals. Below are a few more savings challenges you may consider trying in 2019. 52-Week Money Challenge in Reverse: This is just like the original 52-Week Money Challenge but it starts with you saving $52 in the first week and $1 in the last week. Performing the challenge this way eases the financial stress at the end of the year when many people are celebrating holidays. Bi-Weekly Money Challenge: Another twist on the original 52-week challenge is the bi-weekly money challenge. This also covers the span of 26 weeks but helps individuals who get paid every two weeks participate in the challenge on their pay schedule. 12-Week Savings Challenge: If you want to save more money in a shorter period of time, take on a more intense savings challenge like the 12-week challenge. This helps you save $1,000 over the span of three months. Mini Challenges: If you want to take part in a savings challenge but don’t want to commit to a huge savings goal you can try out a Mini 52-Week Savings Challenge. Mega Challenges: Mega Challenges are great if you want to maximize your savings through a challenge. Instead of saving in smaller increments, this challenge allows you to save even more over the span of a year. Why is Saving Money So Hard? Can You Save $1000 a Month?